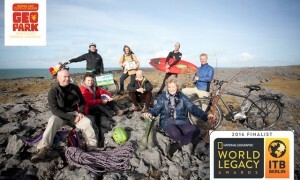 The Geopark, recently designated as a UNESCO site has been shortlisted in the Destination Leadership category of The National Geographic World Legacy Awards alongside Destination Røros (Norway) and Travel Oregon (United States). The Geopark has been named as one of 15 finalists for the 2016 awards, for the work of its GeoparkLIFE ‘Tourism for Conservation’ programme. The winners will be announced at the world’s leading travel trade Show, ITB in Berlin on 9th March. Speaking ahead of the awards ceremony in Berlin, Germany Carol Gleeson, Manager Burren and Cliffs of Moher UNESCO Global Geopark said “the award nomination is testament to the work of our partners in managing sustainable tourism in the Burren that has been developed by regional development agencies and local communities”. “Building on this work the GeoparkLIFE programme began in 2012 with the purpose of developing an international sustainable tourism destination model that not only balances the needs of tourism and conservation but brings together all stakeholders who have an interest in maintaining and restoring the regions natural, cultural and economic integrity” Ms. Gleeson added. “Have you ever heard someone come back from a vacation and say, ‘I just had a great holiday hiking in a dead rain forest and then staying on a beach filled with trash?’ The World Legacy Awards finalists are all about protecting the places travellers love to visit and benefiting the local people who live there. Together, our 15 finalists are working towards a future when all tourism will be sustainable,” he added.